The Asian Human Rights Commission (AHRC) has received information that the military in Khon Kaen province, northeastern Thailand, filed a new legal action against Mr. Jatupat Boonpattaraksa, a student at Khon Kaen University and a key member of the pro-democracy groups Dao Din and New Democracy Movement (NDM). Lt Gen Phitakphon Chusri accused him of allegedly defaming the Thai monarch under Article 112 of the Criminal Code, and imparting false information on the Internet under the Computer Crime Act, after he shared a BBC Thai article “Profile: Thailand’s new King Vajiralongkorn” with an excerpt. However, he did not comment on the article. Around 8 a.m. on 3 December 2016, plainclothes police from the Khon Kaen Provincial Police Station presented an arrest warrant issued by the Khon Kaen Court to 25-year-old Mr. Jatupat Boonpattaraksa, near Prong Chang Temple, Kaeng Khro District, Chaiyaphum province. The warrant, dated 2 December 2016, states that Mr. Jatupat is charged under Article 112 of the Thai Criminal Code, or lèse majesté offence, by Lt Gen Phitakphon Chusri, Deputy Chief of the Operations Directorate at the 33rd Military Circle in Khon Kaen, Northeastern Thailand, after he allegedly shared a BBC Thai news article, “Proï¬le: Thailand’s new King Vajiralongkorn,” as well as quoted some content of the news on Facebook. While the authorities presented the warrant, Mr. Jatupat was participating in the Dharma Yatra walk to Lam Patao bank, an annual event organized by a famous monk Phra Phaisal Visalo at Sukato Temple in Chaiyaphum province. Mr. Jatupat, a well-known activist of the Dao Din Group based in the northeast and member of the NDM, was released on bail after 18 days in detention, with 13 days under hunger strike, in two different cases related to his organizing a peaceful assembly in August. 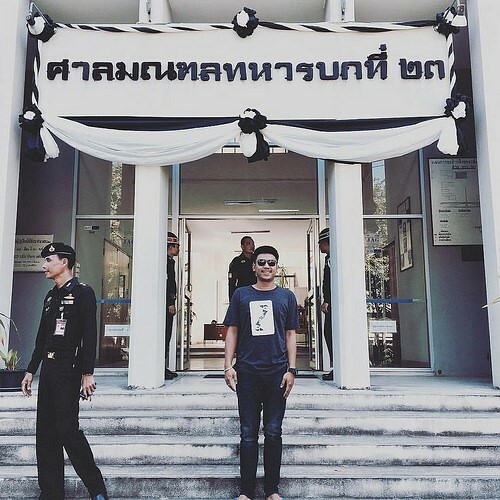 He is now facing another political assembly charge for organizing a coup commemoration event on 22 May 2015 at the Khon Kaen Democracy Monument. The ofï¬cials took Mr. Jatupat to the Kaeng Khro Provincial Police Station to ï¬le an arrest record. News reports state that he was later taken to the Khon Kaen Provincial Police Station. However, as of 2.30 pm, Mr. Jatupat’s exact whereabouts were unclear and no one could contact him. Thai Lawyers for Human Rights (TLHR) had arranged for a network lawyer to offer Mr. Jatupat legal assistance and wait for him at the Khon Kaen Police Station. However, the police seized the lawyer’s cell phone and drove him around in a pickup car, saying that they would take him to Mr. Jatupat. Instead, they took him around the place until ï¬nally they arrived at the Police Training Center Region 4, Khon Kaen. His cell phone was returned once he got out of the car. News reports note further that later Mr. Jatupat was brought to the said Training Center for investigation. Pol Col Wisate Phakdeewut, the chief inquiry ofï¬cer, informed him of his charges under Article 112 of the Criminal Code, which states that anyone who “defames, insults or threatens the King, the Queen, the HeirApparent or the Regent” shall be punishable by a maximum sentence of 15 years’ imprisonment, and under the Computer Crime Act, for imparting false information on the Internet. Mr. Jatupat denied all charges. Around 3:30 pm, the police explained that Mr. Jatupat would be taken and detained for investigation at the Nam Phong Police Station, Nam Phong District in Khon Kaen, not at the Khon Kaen Police Station. The reason given was that this particular case concerns national security, and was a sensitive case that dealt with other parties. It may pose a great threat to the public safety and order if he is detained at the Khon Kaen Station. Since the police ï¬nished the investigation after the usual opening hours (4:30 pm), Mr. Jatupat’s lawyer could not apply for bail. Thus, Mr. Jatupat was detained overnight at the Nam Phong Police Station. On 4 December 2016, the following morning, the ofï¬cials requested a pre-trial detention at the Khon Kaen Court, while Mr. Jatupat’s lawyer opposed that request. The Court indicated that it would skip the due process of investigation, since it would grant bail if applied. Mr. Jatupat’s lawyer, therefore, applied for bail with a 400,000 Baht surety (approx. 11,300 USD) which was granted by the Court. Mr. Jatupat was later released on unconditional bail at noon. On 6 December 2016, Mr. Jatupat went to the Khon Kaen Police Station again and filed a complaint letter to the police because the police did not mention his cell phone in the memo of arrest. In fact, his cell phone was seized by the police since December 3. The BBC Thai news article shared by Mr. Jatupat collected data on the new King Vajiralongkorn, and was released on 1 December 2016 to mark the royal succession. It has received a lot of public attention, with 27,000 likes and 2,600 shares on Facebook to date (2,800 shares before Mr. Jatupat’s arrest). Mr. Jatupat had shared the said article on the morning of 2 December 2016, along with an excerpt; however, he did not publish personal comments on the article. Mr. Jatupat Boonpattaraksa is facing four different lawsuits, and is an example of a Thai pro-democracy activist who has opposed the National Council for Peace and Order (NCPO) administration and its staging of the coup on 22 May 2014. Please write letters to the authorities below, asking them to to drop all charges against and prosecutions of Mr. Jatupat Boonpattaraksa, since his alleged acts were nothing more than the exercise of freedom of expression and were consistent with the Thai Constitution. I am writing to voice my deep concern regarding the arrest of a student activist, which is a serious threat to the freedom of expression in Thailand. Mr. Jatupat Boonpattaraksa, a student at Khon Kaen University and a key member of the pro-democracy groups Dao Din and New Democracy Movement (NDM) was accused by Lt Gen Phitakphon Chusri for allegedly defaming the Thai monarch under Article 112 of the Criminal Code, and imparting false information on the Internet under the Computer Crime Act, after he shared a BBC Thai article “Profile: Thailand’s new King Vajiralongkorn” with an excerpt. However, he did not comment on the article. I would like to point out that this action will create an atmosphere of fear and limit the right of access to information and to freedom of expression. While Thailand has no official censorship board that inspects all material before it is published, this case is establishing Article 112 as an unofficial censorship measure. What makes this particularly dangerous is that the enforcement and interpretation of Article 112 are both uneven, and as indicated by this and other cases, highly political. Persons like Mr. Jatupat will not know that they have crossed the invisible line demarcated by the law until the police knock on their doors to take them away. In addition, I would like to reaffirm that in the determination of any criminal charge against Mr. Jatupat, in according to Article 7/1 of the Thai Criminal Procedure Code, he shall be entitled to the minimum guarantees of arrestee. First, he can defend himself through legal assistance of his own choosing. Second, he must receive visitation of or contact with his relative in appropriate manner. Unfortunately, both minimum disciplines were violated by the police. Therefore, I would like to urge the Thai Government and authorities, particularly the Royal Thai Police, to immediately drop charges and end all acts of judicial harassment against Mr. Jatupat Boonpattaraksa.